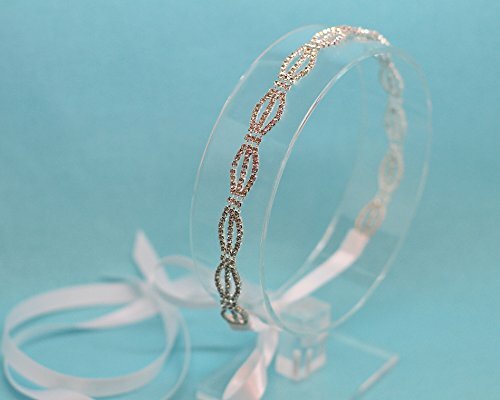 The Woven Rhinestone Headband is the newest addition to our Bridal line. Featuring tons of smaller yet stunning, sparkly crystal rhinestones in a woven pattern creating a simply beautiful WOW effect! The tie back headband is made with a string of Crystal Rhinestones that measure approximately 12 inches long and 1/2" at the widest part. It is attached to 3/8" double faced satin ribbon. The ribbon is then heat-sealed to prevent fraying and ensuring an absolute perfect embellishment to any attire on your special day. This is an amazing photography prop. Crafted with attention to detail, your headband will be packaged with loving care in a box to ensure it will arrive to you in perfect condition for yourspecial occasion.